Christie Prades (center) with the national touring company of "On Your Feet!" Joining Prades in the principal cast will be George Ioannides (Mamma Mia!) as Emilio Estefan, Madalena Alberto (Evita) as Gloria Fajardo and Karen Mann (Fiddler on the Roof) as Consuelo. At certain performances, the role of Gloria Estefan will be played by Philippa Stefani (Rent). The ensemble will include Hollie Cassar, Francisco Del Solar, Katie Dunsden, Eduardo Enrikez, Laura Friedrich Tejero, Denzel Giskus, Francesca Lara Gordon, Yonly Leyva Desdunes, Elia Lo Tauro, Martin McCarthy, Alicia Mencía, Ciro Lourencio Meulens, Carl Patrick, Clayton Rosa, Julia Ruiz Fernandez, Shanna Michelle Slaap, Dawnita Smith, Frank van Hengel, Despina Violari and Alain Zambrana Borges. The role of Little Gloria will be shared by Klaudia Gjergji, Holly McDonagh and Emily Perra; the roles of Nayib/Young Emilio/Jeremy will be shared by Santiago Huertas Ruiz, Jonathan Naranjo and Alejandro Puentes Motato. 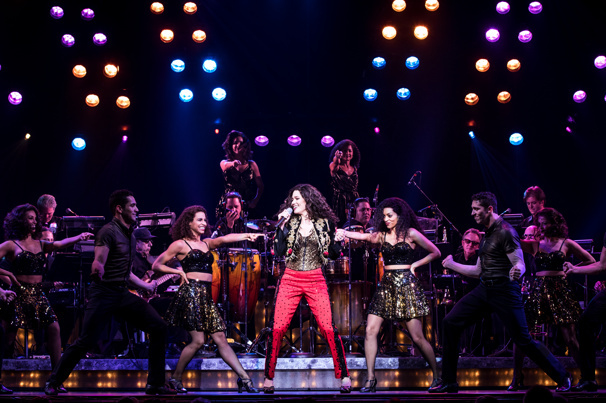 Based on the lives and music of the 26-time Grammy-winning husband-and-wife team Gloria and Emilio Estefan, On Your Feet! is the story of how two people who—through an unwavering dedication to one another and their pursuit of the American dream—showcased their talent, their music and their heritage to the world in a remarkable rise to global superstardom. Featuring a book by Oscar winner Alexander Dinelaris, On Your Feet! features some of the most iconic songs of the past quarter-century, including "Rhythm Is Gonna Get You," "Conga," "Get on Your Feet," "Don't Want to Lose You Now," "1-2-3" and "Coming Out of the Dark." Two-time Tony winner Jerry Mitchell repeats his work as director for the West End production, with Sergio Trujillo re-creating his Tony-nominated choreography.